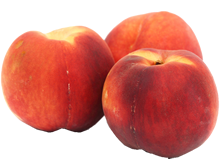 Peaches originated in China where they were cultivated since the early days of Chinese culture. Considered the favorite fruit of emperors, peaches were first mentioned in Chinese writings dating back to the 10th century. From China, the “Persian apple,” the translated Latin name, was introduced to the Romans by the Persians (now Iranians) and later introduced to Europe by Alexander the Great. Finally in the early 17th century George Minifie, a horticulturist from England, brought the first peaches to the New World colonies, planting them at his estate in Virginia. It was our early American Indian tribes who actually spread the peach tree across our country, taking seeds with them and planting them as they traveled these United States. But it wasn’t until the 19th century that commercial peach production began in Maryland, Delaware, Georgia and Virginia. Today, peaches are grown commercially in California, Washington state, South Carolina, Georgia and Missouri.